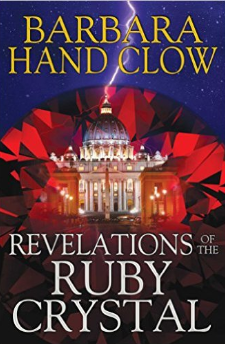 In her debut as a novelist, bestselling author and acclaimed teacher Barbara Hand Clow weaves together a story of romance, deep earth forces, psychic powers, aristocracy, and Vatican world control centered on an ancient ruby that inspires mystical visions. Set in Rome in 2012, the story follows Sarah Adamson, a beautiful young Catholic graduate student from Boston studying at the Vatican Library for her thesis on the first Christian heretic, Marcion of Pontus. She is being courted by two utterly different men: Simon Appel, a descendent of the kabbalist Isaac Luria who covers Vatican affairs for the New York Times, and Armando Pierleoni, the heir to an ancient Italian aristocratic family with strong ties to the Vatican. After a terrible encounter with the dark side at a castle in Tuscany, Sarah is given a ring set with a ruby crystal, a powerful stone that was once the third eye of an ancient Buddha statue in Nepal. With the mystic ring on her finger, Sarah’s visionary abilities are ignited. She remembers her past life as the Sibyl of Cumae, a Roman oracle whose powers are now being channeled by the Vatican to maintain world control. As Sarah’s research and visions reveal the cause of evil in the Church and Simon’s reporting exposes the depth of the sexual abuse scandals surrounding the Vatican, the two form an alliance with an ex-lover of both Simon and Armando, Claudia, who describes secret priestly power rituals going on in Vatican City. As the heightened energies of the winter solstice of 2012 arrive and 2013 dawns, will Simon and Sarah be able to harness their divine powers for transformation? Will the Vatican seek new direction as it elects a new pope? Revealing the very nature of how evil gets into the world, this novel of romance, mystery, heresy, and spirituality uncovers the esoteric foundations for the emergence of a golden new age. 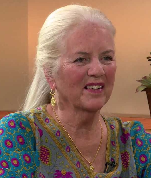 Barbara Hand Clow is an internationally acclaimed teacher, author, and Mayan Calendar researcher. Her numerous books include The Pleiadian Agenda, Alchemy of Nine Dimensions, Awakening the Planetary Mind, and The Mayan Code. She has taught at sacred sites throughout the world and maintains an astrological web site, www.HandClow2012.com.